There are a couple of good articles from Seattle Like's Bikes. The first article points out the confusing nature of the route and some suggestions for improvements. 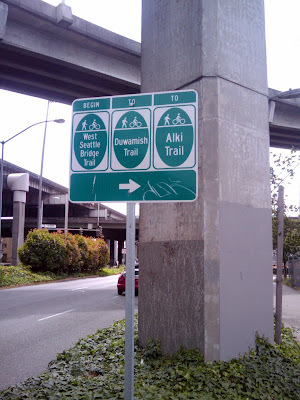 The next article, highlights the SDOT improvements, presumably brought about by the author. For those who use the Delridge sidewalk route beyond the lower bridge, the debris and muck has been cleaned and a key crossing has been striped. Small improvements, but a big difference. For more information on the West Seattle routes, see this page.